This unique enzyme mask delivers advanced exfoliating technology utilizing Lime Pearl Caviar to gently rejuvenate the skin. This complex formulation delivers gentle exfoliation with a burst of antioxidant support to treat all skin types. contains the ingredient Lime PearlTM, a natural source of AHA’s extracted from the precious Caviar Lime, especially designed to enhance skin desquamation with an innovative mechanism of action, without irritation. Protease from pineapple works with Caviar Lime to more effectively exfoliate and brighten the skin. Natural passionfruit extract gives the mask its appealing color and intoxicating aroma. This exotic fruit is loaded with antioxidants and skin-boosting Vitamin A. Dispense 1 tsp. 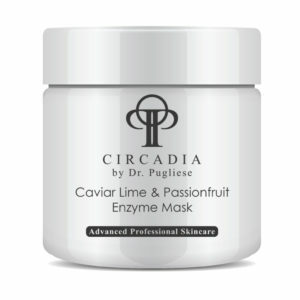 Caviar Lime & Passionfruit Enzyme Mask into portion cup. Apply to face and neck with fan brush. Optional massage or hot towel application, leave on for 5-10 minutes. Remove with warm towel or 4×4 gauze. Pat skin dry.